Guess what the U.S Military Academy needs help with. Here’s a hint — same thing as scientists. 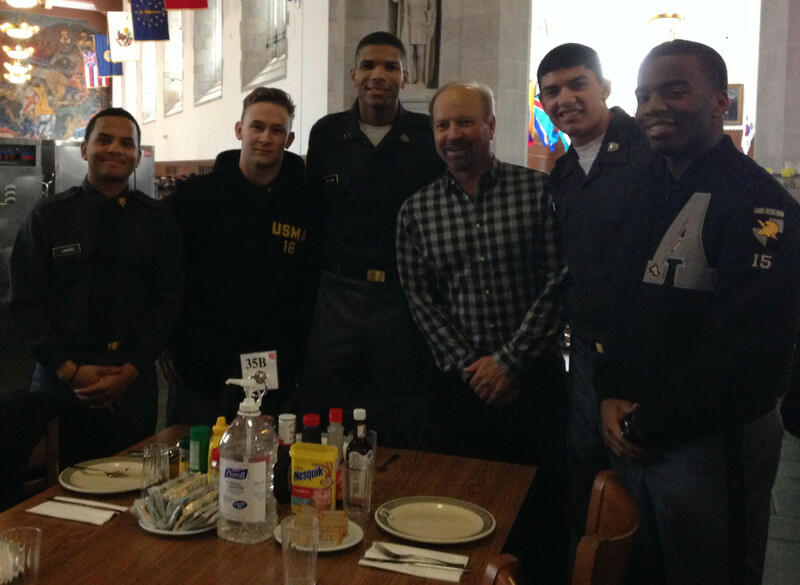 I sat at lunch with these cadets asking, “So is there a communications department here?” Nope. “And no film program?” Nope. “And no media center where you guys can make videos?” Nope. Nothing. Doesn’t the military know what a fundamental part of today’s world communication is? One of them said, “Keep in mind, this place was founded by engineers.” Bingo. MA BOYZ. These are some of the members of the Film Forum at West Point. To my right is my buddy Tony Holland. He’s the cadet who contacted me last year, out of the blue, after reading about my book online. He had no clue my father graduated in the class of 1939. They are all incredibly sharp folks. And there are lots of women around, though not in this group. My father, rest his soul, was the world’s worst storyteller. He had a passion for military history, and he bored the holy hell out of our entire family with it. It is out of some bizarre backwards respect and fondness for him that I am waging this planetary campaign against boredom. So I’ve spent a few decades trying to pinpoint the source of the boredom in the science world. Now I see the same problems at the United States Military Academy. Amazing. They get very little if any training in communications. The result is a lot of robotic speakers. Which really is not a good thing in today’s rapidly communicating world. But I’ll let them grapple with that. 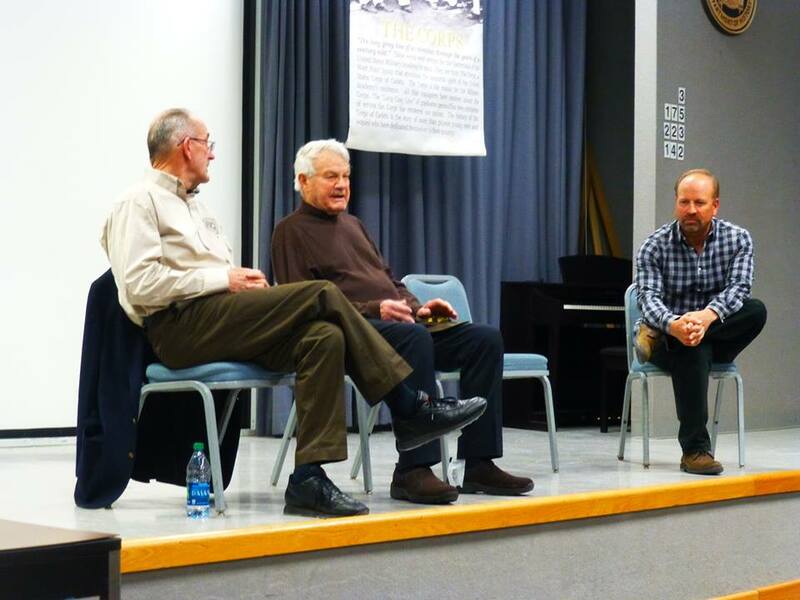 We had a fascinating screening of the latest rough cut of my movie, “40 Years of Silence,” to a small group of cadets. Even more fascinating than the movie than the movie was our post-screening panel discussion. I moderated it with the three very interesting fellows — John Patterson (founder of the Philippine Scouts Heritage Society and friend of my father), Dan Crowley who fought on Bataan in 1941 at the start of World War II then ended up as a POW, and Major General Edward Mechenbier who was a POW in Vietnam (see below). RETRACING MY FATHER’S FOOTSTEPS. Pretty fascinating day. Today’s cadets are not the rigid, robotic creatures of days gone by. 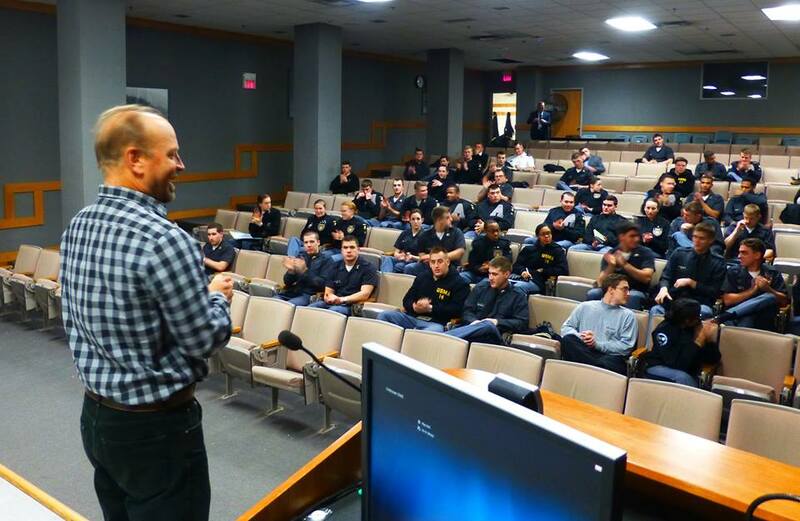 In civilian clothes you would have thought you were just talking to a group of undergrads. Except that they all say, “Yes, sir,” to everything. Actually, they would probably be good at improv given that habit — they’re all set to say, “YES, sir, AND …” to everything. 90 IS THE NEW 25. That’s Dan Frickin’ Crowley in the middle. The guy is in my movie and is a medical marvel. He’s 91.5 years old, his girlfriend is 54 and extremely cool — he introduced her to two of the West Point colonels saying, “She served in the corps.” They smiled and replied, “Oh, Marines, hunh?” to which he howled with laughter saying, “NO! The PEACE Corps, in Africa for five years!” He’s as full of life as a 25 year old, despite having been a prisoner of war in Japan from 1942 to 1945. The fellow on the left is equally amazing — Major General Edward Mechenbier, who was a POW in Vietnam for 6 years after he was shot down. He ended up being the last Vietnam POW to retire from the military. He was as equally funny and charming as Dan. How in the world these guys could endure so much abuse and still have such a great sense of humor is truly amazing. THE OLD MAN, 1939. 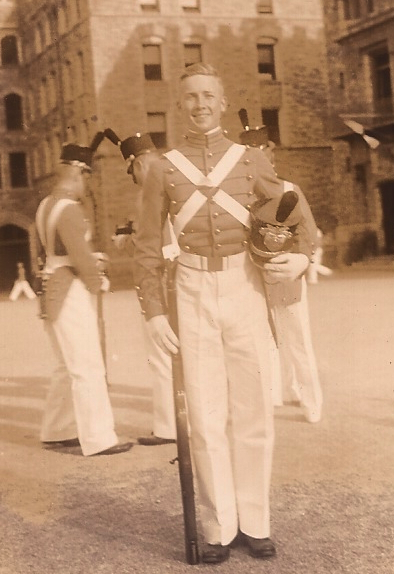 That’s my dad, all dressed up, West Point cadet, Class of 1939. It was a different world back then, by a long ways. If he’d seen me there at West Point on Monday he’d have been pleased. Though if he’d heard Dan Crowley talk about how we need to “finish the job” with Japan he’d probably be as distressed as the poor cadets who didn’t quite know what to say to his political incorrectness. 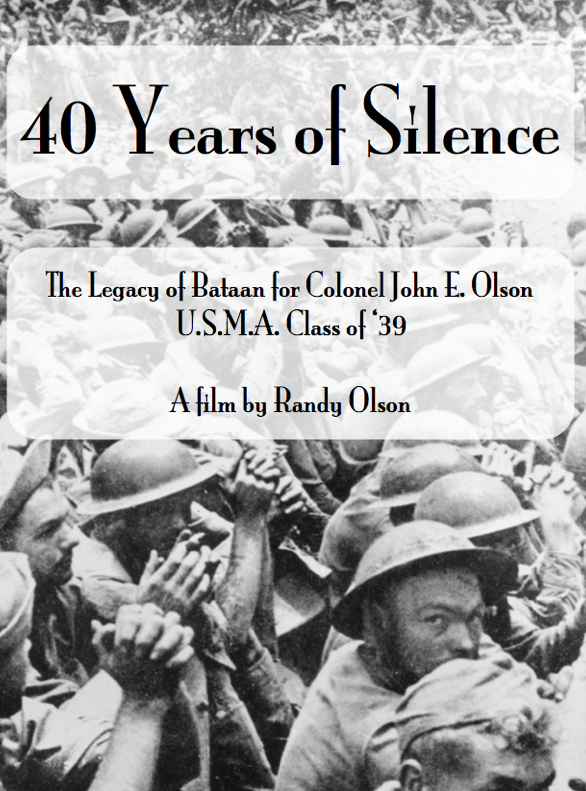 On Monday I will be at the U.S. Military Academy at West Point screening the rough cut of my documentary feature film, “40 Years of Silence.” It’s going to be a fascinating day. 40 YEARS OF SILENCE. A temp graphic for Monday’s screening. We still have another 6 months of work to do on the movie. Takes a long time to tell a good story. This is the 5th year for this project. Will probably come out about the same time as “Unbroken,” which has just begun post-production and is similar material. This is a documentary that began in the spring of 2010 as a collaboration with my long time Executive Producer (also know as my mother, Muffy Moose). It started as an evening talk she and I gave in Wichita where she told about the personal side of her World War II experiences, and I delivered the military history side. She met my father on the troop ship to the Philippines in 1939 on the eve of World War II. He had just graduated from West Point, she was the daughter of Major General Richard J. Marshall who eventually became Chief of Staff for General Douglas MacArthur and spent more time at his side than anyone else in World War II. In 2011 I began making a film — half of which we screened at Cornell that fall. In 2013 we screened a second draft at Brown University. Then I spent all last year creating a whole new cut, now titled, “40 Years of Silence,” which I will be screening Monday evening at West Point. The new version focuses primarily on the American soldiers who were Prisoners Of War in Japan, using my father as a case study in how little they talked about their experiences when they returned to the U.S., and what the long term consequences may have been. In the case of my family, my father abruptly walked out on all of us after 42 years of marriage. It’s a complex film that has taken years to find the strongest way to tell the story. It’s still not finished. We’ll probably take another six months. But the timing is actually good, given that an editor friend just told me they have to clear out of their editing suites at Universal Studios by the end of next week to make room for Angelina Jolie who has finished filming, “Unbroken,” in Australia and is ready to begin editing. That’s the amazing story of Louis Zamperini, who ended up in the same prison camp as my father at the end of the war as they were both moved out of camps in Osaka. Hopefully that will be a good movie that will help set the tone for this one. Just hope she doesn’t need 4 years of editing as I have. It takes time to tell a good story. That’s lesson #1 in the world of storytelling. #331) Tweeting ABT’s: Is Twitter Maladapted to Narrative Structure? Here’s some food for thought. 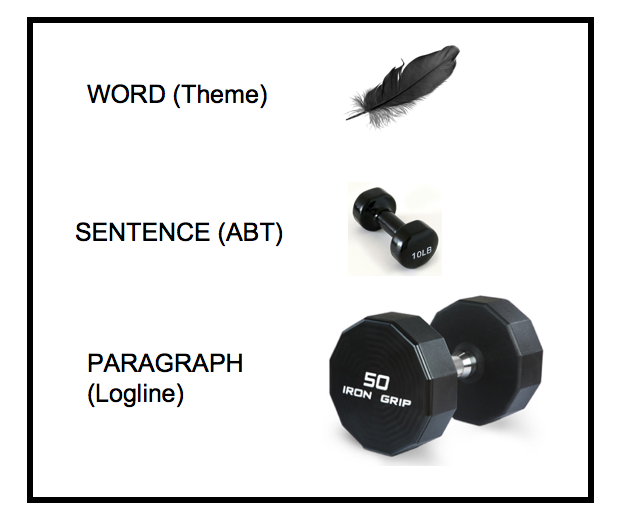 We know the ABT (And, But, Therefore) template helps you find the narrative core of a thought. 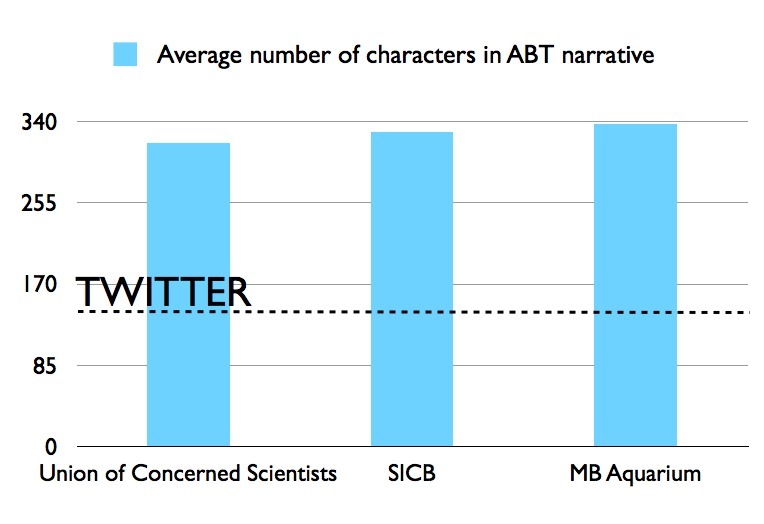 For the first 3 groups who used our Storymaker app last fall, their ABT’s averaged over 300 characters. Twitter only lets you use 140 characters. Which suggests that squashing your idea down by more than half might lose the entire narrative core. The 140 characters of Twitter comes from the 160 characters of SMS, which was created in 1985 by a guy calculating the average number of characters in sentences he typed. Nowhere along the line did anyone ever talk about narrative dynamics. So the technology has driven the narrative. Is everybody cool with this? TWEET THIS. Looks like, when not given any Tweeting constraints, people naturally construct an ABT of a little over 300 characters. Which means they would have to cut that thought more than in half to squash it into Twitter. The goal is for communication to be both concise AND compelling. What does this say about how compelling Tweets are. And is everyone certain 140 characters is the ideal length? Interesting observations we’re making on the ABT template as we go along (if you’re not familiar with it you can hear about it here and read about it here). We know it brings the gift of concision. At Kansas University in September we had volunteers describe a painting without guidance (they took 28 seconds and rambled) versus using the constraint of the ABT (took 13 seconds average, were very concise and more interesting as they told a story). So we know it produces concision. But what about being compelling? In our workshops we have everyone read their ABT’s aloud. What you find is some people who err in the direction of “over-concision” — meaning their ABT is so short it lacks information causing it to lack impact, meaning it is not very compelling. I end up recommending they add back in a few key words to give it more punch. Then others err in the direction of “lack of concision” as their ABT is too long and clumsy. They need to trim their ABT. All of which suggests there’s roughly an optimal length to the ABT. Which then begs the question of how that matches with the 140 characters of Twitter. And it looks like it doesn’t match. Of course, most of the ABT’s constructed for the graph above had not yet undergone the group scrutiny, so they could all stand to be shorter. Plus the words “And, But, Therefore” could probably be abbreviated in the tweet along with other words. But still, it’s difficult to squash it all into 140 characters. You may be thinking, “I’m sure some brilliant people somewhere have already considered this.” Maybe. But as we pointed out in “Connection,” the latest resource we could find on “the Elevator Pitch” (which is essentially what an ABT is) was Dan Pink’s bestselling book, “To Sell Is Human,” of 2012, where he devoted an entire chapter to the elevator pitch and reviewed 6 different versions of it. Nowhere in that chapter did he come close to defining narrative structure as the core principle for creating a single sentence. He did talk about “The Pixar Pitch” which is similar to the Logline Maker in our app, but that is long and clunky, and not likely to be “pitchable” in a single elevator ride, unless you’re stopping at every floor. Nobody is working on the ABT. It’s new ground. And I think this is an interesting question to pose about Twitter. SO WHO CAME UP WITH 140 CHARACTERS FOR TWITTER? AND WHY? Some guy sitting at his typewriter in Germany in 1985 — that’s who. Seriously. According to this article in the LA Times, Friedhelm Hillebrand counted the average number of characters in sentences he was typing and decided 160 was good for the initial conception of SMS (which became texting). Subsequent committees considered it further and, based on the length of text in postcards and telexes, concurred. Twitter then modified the 160 down to 140, and presto — the whole world now communicates through a length that was conceived with zero discussion of whether the thoughts that would be transmitted would have narrative form or strength. Is it the right length? This becomes an exercise in adaptationism and “Just So” stories. I’m sure most people would want to believe 160 characters has proven to be perfect because no one has felt the need to change it. But lots of things in our society are poorly designed yet will not be redesigned because the momentum against it is just too great. Who knows. The one thing I do know that I learned from the great evolutionist Stephen Jay Gould is that the real world — whether biological in design or human — never achieves perfection. BOTTOM UP CREATIVITY — REALLY? We knew it. Trey Parker knew it. Socrates, Kant, and Hegel knew it. An analysis of 800 Project Gutenberg books from computer science folks at SUNY Stony Brook shows the most popular and successful books have two traits: 1) simplicity of writing, 2) contain “more conjunctions such as ‘and’ and ‘but’.” Time for Judge Judy to rap her gavel and say, “ABT: CASE CLOSED.” But also the study is a little frightening for writers. If my TEDMED Talk and Science letter weren’t enough, will you believe DAAAAAAAY-TA (as Oscar-nominated actress Melissa McCarthy once said in one of my films, “That’s a mighty big word — does that make a little man feel like a big man?”). Now there are data to show it works. The ABT is the tool I used to turn the CERF Sea Level Rise plenary panel from “a pile of s****y facts” (to quote famed geneticist Theodosius Dobzhansky) into a structured narrative presentation that held the interest of 1,000 people for an hour. It is indeed that powerful. And now there is a major breakthrough — a quantitative study that shows a clear correlation between the ABT elements and successful communication. 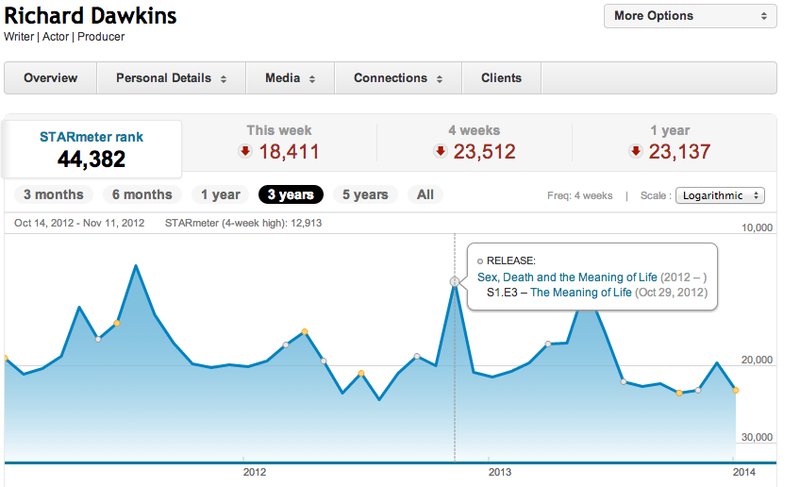 Yes, it’s only a correlation, but come on … use a little instinct at this point. Don’t let your data obsession cloud your common sense. The study by three members of the Department of Computer Science, SUNY Stony Brook quantitatively analyzed 800 famous books that are part of the Project Gutenberg collection. One of their findings: successful books contained “heavy use of conjunctions such as ‘and’ and ‘but’.” Which is two thirds of the ABT. And why not — we are proposing that the ABT is THE universal narrative template. It is the very core of storytelling. So all this finding says is that the most popular books were the ones that had the most story structure. Which is simply what you would expect from a “storytelling animal” (to use Jonathan Gotschall’s title of his excellent book). What a strange, metric-obsessed world we are continuing to create. THIS IS AN IMPORTANT UPDATE. It’s been 4 months since we introduced our WSP Model through the book and app. We’re still learning how to use it. This is an intuitive look at the model. If you’ve struggled with the Logline Maker, this may help you get a little better perspective on its strength and use. Overall, it’s time to start looking at storytelling in terms of “Narrative Fitness Training,” and get away from this notion of becoming a great communicator in a one day workshop. It takes time. “NARRATIVE FITNESS TRAINING” AND AN INTUITIVE LOOK AT THE WSP MODEL. The “theme” is like a feather — light, wispy, elegant, but not that powerful. The “Logline” is the other end of the spectrum — a 50 lb weight that is the true powerhouse — it will take you a while to get strong enough with narrative to use it effectively. The “ABT” is the element that is riiiiiight in the middle (like Goldilocks) — universally applicable, yet still very simple — it is your best and most effective entry point in using the WSP Model. But in the long run, the Logline is the tool that will give you true narrative strength. I’ve come to realize this is the number one misconception we’re up against. Everyone is now celebrating “storytelling” as the great new cure for communication problems, which it ultimately is. But lots of people are giving the impression that it can be “learned” in a single day or a few days through workshops. It can’t. Not by any stretch. If you doubt this, I have a few hundred thousand failed screenplays in Hollywood to show you. Which is the truth. I know, I’m buddies with the guy who hired him at the video store in Manhattan Beach back in the 80’s where they would all get together and watch countless movies and read screenplays. That was the “10,000 hours” of investment that Malcolm Gladwell talks about in his book, “Outliers.” The math is right there for Quentin, no mistaking it. Effective storytelling only happens when the process moves down to the level of instinct, which does not happen in a one day workshop. It takes time. And this is becoming my new message for the New Year. So this is the new diagram for our workshop and talks, and my overall message. The ABT is incredibly flexible, powerful and widely applicable. It is your entry point to narrative structure. But the Logline Maker is the real challenge, and you can spend an entire lifetime and never really master it. Dorie, Brian and I have had some lengthy chats about this recently. We’ve seen it in our workshops. The ABT is hugely satisfying to work with for the participants while the Logline produces a lot of frustration. So the big difference is that the Logline needs a much longer timeline than a single workshop. It’s something for everyone to slowly set to work with. We are now advocating a long term perspective with this stuff. If you’re really committed, it’s about setting yourself up on a weekly regimen — basically doing narrative fitness training. 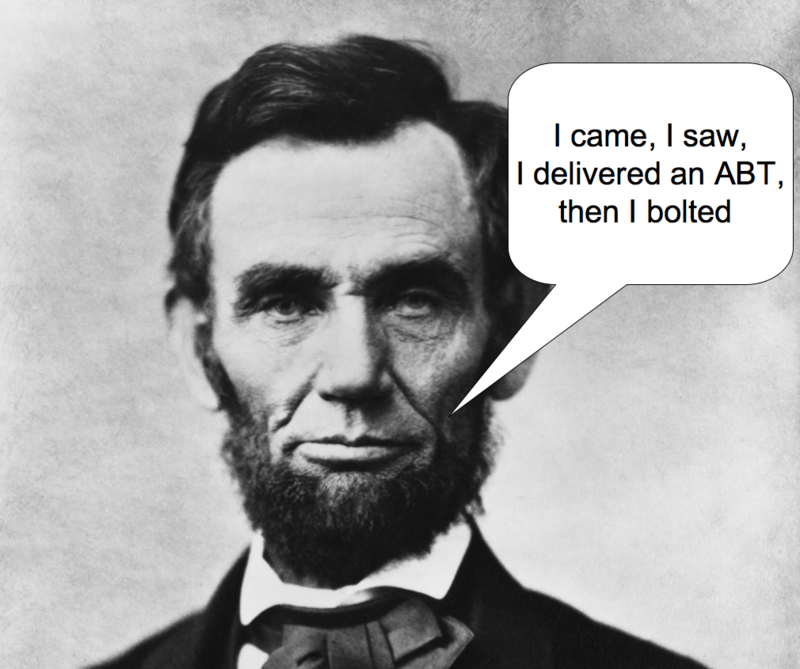 We recommend 5 ABT’s a week and one Logline. Within a couple months you’ll start to see a difference. We guarantee it, or we’ll refund the money you didn’t spend when you downloaded the Connection Storymaker app for free (hopefully). Bill Nye has committed to what is shaping up to be the highest profile “debate” of evolution versus creationism since the Scopes Monkey Trial of nearly a century ago. He will be debating Ken Ham, the colorful Director of the Creation Museum in Kentucky. Some major science voices have already recommended he not do it. But I think it’s a textbook case of the need to talk substance in an age of style. It’s a chance to put a popular, well liked face to the entire topic of evolution (plus if he has a single message at this point it’s his Youtube video that says creationism is not good for your kids which has over 6 million views). I support his doing it. DATA! Feast your eyes on this, science fans. This is from the “pro” version of the Internet Movie DataBase (IMDB). Bill Nye hit a high of 989 a couple years ago. That’s impressive. And powerful. There is no higher profile voice for evolution right now (for comparison, see below, Neal deG. 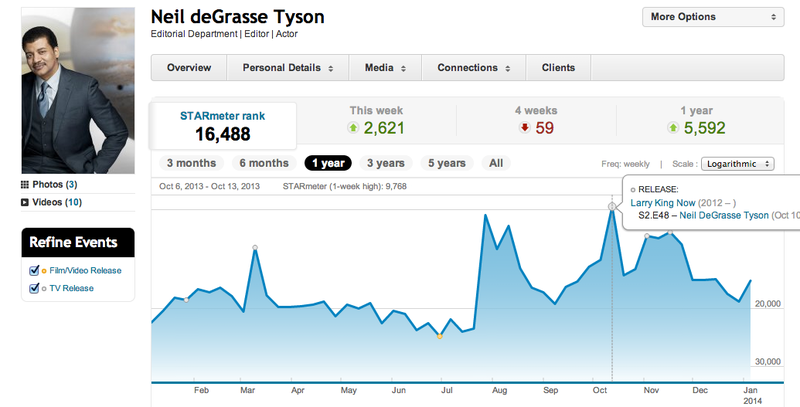 Tyson and Richard Dawkins have almost never even broken 10,000). Plus … they loved him on “Dancing with the Stars” meaning he has that magical, elusive thing that politicians would kill for called “likeability”! Now Bill Nye, the highest profile voice for science in this country, has decided to defend evolution in a debate on February 4 at the Creation Museum in Kentucky. Let me start by deferring to Gerald Graff, whom I interviewed in Flock of Dodos. He wrote two books that I cite frequently these days — “Beyond the Culture Wars: How Teaching the Conflicts Can Revitalize American Education,” and “They Say, I Say: The Moves That Matter in Academic Writing” I really think people should read his two books before they weigh in on this debating issue. The latter book has sold over a million copies and is now used in college courses across the country for the teaching of argumentation. His point with “Beyond the Culture Wars” is that everyone learns best when there is a source of conflict (like a debate) to help focus attention. I wholeheartedly agree with this. (And guess where else conflict is essential — in the telling of stories). More to the point, look at how much broad media coverage evolution has received over the past 20 years. A decade ago the conflict and debate around the teaching of intelligent design put it on the cover of every major magazine and helped propel my movie on to Showtime. Now all the mass media attention to evolution has died down. Yes, I know some scientists find the mass media to be a lot of distracting noise, but we did more than a couple hundred large screenings of Flock of Dodos and I’m sure several hundred thousand people saw the movie through Showtime and Netflix. This is how you educate the masses — through debate and conflict. Bill Nye understands this. SO WHICH TEAM IS MY FAVORITE CELEBRITY ON? I have spent more than 20 years hanging around Hollywood, often involved in celebrity events for everything from the oceans to hunger relief to disaster relief in Haiti to just good old fashioned parties in the Hollywood Hills that rage until sunrise (where people like Vince Vaughn or Winona Ryder show up drunk, ah, the good old days of film school). I also grew up in Kansas and have lots of friends and family there still, whom I visit several times a year. Gun control? Just tell me which team George Clooney is on. Affordable Care? Just tell me which team Jay Z is on. Immigration Reform? Just tell me which team Jennifer Lawrence is on. SO WHO IS ON THE EVOLUTION TEAM? Pretty much nobody for celebrities. Sorry. I mean that in relative terms. There are armies of celebs on the environmental team. I’ve turned out bunches of them for PSA’s and events in Hollywood. It’s a piece of cake. Same for hunger, disease, and everything else that physically improves people’s lives in obvious ways. But evolution is not the same. We had one major TV actor who helped us with our Shifting Baselines campaign — the star of a top ten TV show and a great guy. My assistant Ty had several interesting and substantive chats with him. 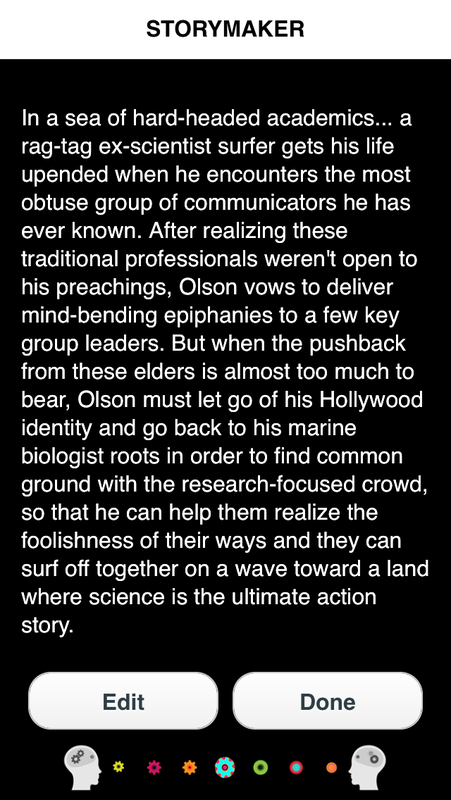 So I got ready to make a pitch to him about doing a pro-evolution PSA around the time of Dodos, then we spotted an interview where he talked in depth about his “spirituality” and closeness to God. Which ended that line of thought. And that’s the deal. Most celebs are very “spiritual,” as are the bulk of their fans. Evolution is perceived as non-spiritual. Yes, I know lots of evolutionists are religious, but we’re not talking about reality here, only perception (that’s all that matters in the media world). It just is. And so there are very, very few celebrities willing to step forward in its defense. I’ve talked with Genie Scott about this numerous times. It’s a challenge. Yes, there’s a few (like Seth MacFarlane who is awesome about it). But only a very few. It’s not like other issues. I was surprised to see his appearance on “Dancing With The Stars” last fall didn’t shoot him up above 1,000 on the Starmeter (see above). Regardless, he scored a ton of media exposure and most importantly, the fans LOVED him. No other scientist has that sort of mass adoration at the moment. Maybe Neil deGrasse Tyson will get it with his upcoming “Cosmos: A Space-Time Odyssey” series (for which Seth MacFarlane is an executive producer). Richard Dawkins can forget about it with his recent endorsement of “mild pedophelia” (doesn’t matter if he doesn’t really endorse it, he or his publicist allowed the perception to arise in the media). More importantly, what this event is about is the subtitle of my first book, “Talking Substance in an Age of Style.” The general public doesn’t really want to hear the details of how evolution works. They just want the STYLE component — in two ways: which team are my celebs on, AND what are the spokespeople for each side like — SPECIFICALLY do I LIKE and TRUST the guy who is speaking for evolution? Some angry and dismissive evolution professor (of the sort that debated an intelligent designer in the Seattle Town Hall a decade ago that I mentioned in my book) is not going to do squat for the evolution cause. Bill Nye is not angry, not dismissive, not arrogant, and is perceived as fun, friendly and trustworthy. Yes, the academics will probably find some moments to chop him up over whether he talks about the proper selection coefficients when it comes to allopatric speciation, but the general public … they could care a less. This is a high profile event BECAUSE Bill is doing it. It will get lots of media attention. Despite many pro-science folks on blogs saying they would not give their $25 for a ticket, the event supposedly sold out in 2 minutes. It’s time for the media to start cranking up the “New Millenial Scopes Trial” angle on it. There will be very little “teaching” that takes place with it. But there will be plenty of “imagemaking” for the entire subject of evolution. The best thing that could happen is that Nye gets under the skin of Ken Ham, causing him to have a few unlikeable moments. That will go much further than any effort to “go for the jugular” (sheesh, that was the line a whole bunch of academics said they wished I had done with “Flock of Dodos” — as if there has EVER been a jugular for the creationists) by supposedly “out-arguing” the creationist. Here’s the Starmeter plots for these two guys who are probably the next highest profile entertainment voices for science. They both hover in the 10,000 to 20,000 range while Bill Nye is firmly better than 10,000. Hello Benshi readers! My name is Steph Yin, and I’ve been working with Randy Olson on social media outreach since August. I attended the Annual Meeting of the Society for Integrative and Comparative Biology with Randy this past weekend, and tweeted about it. In case you missed it (especially if you meant to attend but were thwarted by snow! ), I’ve Storified it below with commentary and extra links. Feel free to join in on the conversation on Twitter: Randy’s at @theBenshi. AUDIENCES CAN BE LIKE ENZYME KINETICS. 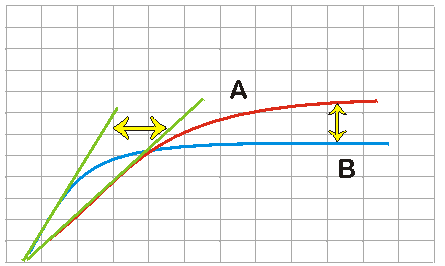 The blue B curve would be the business and Hollywood communities who are quick to adopt new ideas, but have too short of an attention span to gain full value from the ideas. The red A curve would be research scientists like the folks at SICB who are VERY resistant to change, but have the long attention span, enabling them to eventually get the full value of a new idea (assuming everyone lives long enough to see it happen). Okay, before we get started here, take a look at this heading, “BRED TO NEGATE” and think about what your immediate response to it is. If your first thought is, “Well, I wouldn’t really say scientists are “bred to negate,” just think for a second whether you realize you are starting by wanting to negate that heading. I’m just asking you to consider whether you’re really aware of how much you start just about every thought with a process of negation. Not saying it’s wrong. Just asking if you’re aware of it (which was a major part of my book, “Don’t Be Such a Scientist“). That’s all for now. I just had a really wonderful 3 days in Austin where I gave the Opening Plenary at the annual meeting of the Society for Integrative and Comparative Biology to about 700 scientists, then we ran a 90 minute sample version of our Connection Storymaker Workshop. All 16 slots for the workshop were filled, but in addition, about another 40 people showed up to observe, which was cool and impressive. I used to be a member of SICB when it was The American Society of Zoologists so there was an element of “old home week,” to my visit — especially as my Ph.D. advisor, Ken Sebens, introduced me for the big talk by calling me “the Jane Goodall of sea squirts” (she lived in the wild with her primates she was studying, I spent 6 to 8 hours a day underwater on the Great Barrier Reef with the sea squirts I was studying). Lots of fun reunions with people — some I hadn’t seen for over 20 years, but make no mistake, SICB is a tough crowd. And they showed it after my big talk. Unlike audiences I speak to from the business community (who are on at one end of the acceptance spectrum shown below) there was a strongly negative, critical tone to this group. Which is a good thing in terms of them valuing truth and accuracy over all else, but is also sort of life-draining when it comes to broad communication. In my first book I talked at length about the need to balance negativity and positivity. It does no good to be a brainless Hollywood producer who says yes to everything (it is the driving force behind $100 million movies that flop). But just the same, starting all conversations with “no” simply does not work for communication. It is great and essential for good scientific research, but when it comes time to communicate, the process just is not as simple as negating things to pieces. Sorry. It just isn’t. And you really should trust me on this (before saying, “No, I think that…”). I’ve put in a lot of years in two professions. And yet … I could feel that a lot of the audience didn’t care. They needed to prove these things to themselves. And yet aren’t interested in spending 20 years in Hollywood to fully learn it. Which really doesn’t add up in the end. One question was about excessive use of the Hero’s Journey template leading to homogenization, one was about my failing to grasp how “special” science is (when the questioner actually failed to grasp Joseph Campbell’s use of the word “special” which I had clearly explained), and the third was disagreeing with my low opinion of the “and, and, and” structure. And why do I say this so confidently — because I was a member. I know it all too well. Tough crowd. When it ended, a group of about 20 people came up who were mostly great, but the first to talk was a Scottish grad student who rather tersely pointed out I had no data, no controlled studies, no published peer-reviewed papers — nothing but anecdotes and speculation … to which all I can say is, dude, communication is not the same as research — trust me, I’ve done both, you haven’t, I know what I’m talking about here. If your communication strategy is going to be based ONLY on “facts” that arise from data sets and controlled studies you’re going to have very little to say at the podium. It just isn’t the same. There’s a real world element that is different from the cloistered setting of the research laboratory. So I’m not looking to argue about this. Don’t waste your time. I’m just telling you this is what I see. I talk to all these different audiences. They end up falling along a spectrum. At one end there is the business and Hollywood crowd. They are full of energy, excitement, and eagerness to try new ideas. BUT … it’s kind of hard to get them to stay focused and actually take an idea the whole distance. Also, while they gobble up the storytelling stuff, they really have little interest in this thing called “accuracy.” They just want to get people excited so they can make money. In the middle is the public health crowd — much more concerned that their public health facts get communicated in an accurate manner, but also, because they have the word PUBLIC in their field of work, feel strongly compelled to communicate effectively. And then there are the scientists … I beat them up enough in my first book, “Don’t Be Such a Scientist.” They are just tough. But on the up side, I felt one thing very clearly after my talk that gave me hope, which is that as I explained the need for “narrative training” and the fact that it is something that requires a long term perspective and commitment … THAT is where I saw a ray of inspiration. They get it on that front. Hollywood and the business world, it is well known, have zero interest in anything beyond the next fiscal year. This is how science differs. It comes at the cost of that grouchy, negating attitude in the short term. But it is eventually balanced out by this ability to think in the long term. 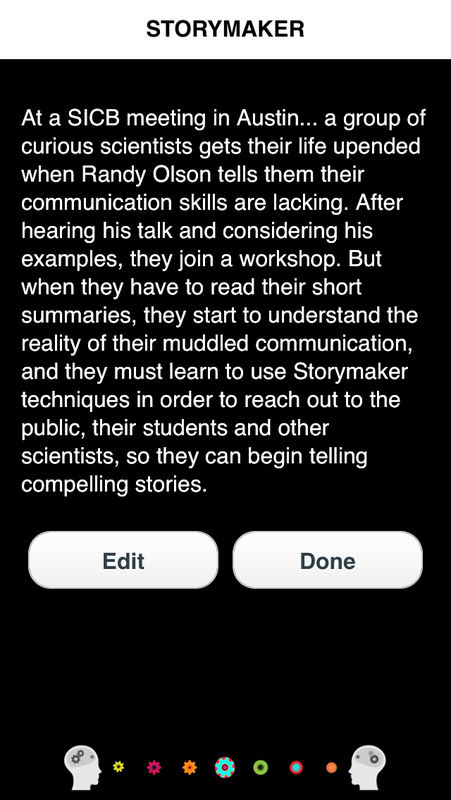 So just to prove that despite this negating atmosphere, there were still more than enough awesome wonderful enthusiastic people, two of them on their own downloaded our Connection Storymaker app, then used the Logline Maker to tell MY story at SICB and emailed their stories to me, which is hilarious. Thank goodness for these people. They give me hope for the long term, even with tough crowds like SICB. Two really good essays from Think Progress and the Breakthrough Institute paint a clear picture of the planet and it’s not as grim as a lot of people would prefer. But this just makes the communication challenge more difficult than ever. It’s easy to communicate the truth when the truth is insanely urgent and dramatic (the recent documentary “Blackfish” is an excellent example of this—the power of whales and human death override any narrative imperative). But what do you do when the problems become more long term, subtle and less visible. You have two options: lie or get better at communication. I’m for the latter. I’m in total agreement, and yet there is the endless challenge of walking the fine line between “guarded optimism” versus ill-informed environmental “skepticism,” of the Bjorn Lomborg variety. The only thing I know for sure is that it calls for even more focus on skillful and accurate communication. Rallying the masses is easy when the threats are large, obvious, urgent and with high stakes. But a whole lot harder when they’re not. The recent documentary “Blackfish” is excellent and everyone should watch and support it. I was an undergraduate at the University of Washington in 1976 when the good people of Puget Sound finally rose up against the horrible practices of Sea World and kicked them out of the state for good. I would like to say I was a major part of that effort, but, alas, I was 21, living in a fraternity with only two things on my mind, the environment not being one of them. But I do recall being incredibly disgusted at the stories I heard from friends who went out there and joined in the protest. Sea World has now spent generations doing horrible things to orcas. They need to stop. And apologize for their greed. “Blackfish” ends up being a case study in the rare instance where you really don’t need to work too hard on overall narrative dynamics. The movie doesn’t tell much of an overall story, other than these people are horrible and need to be stopped. It is the very sort of “And, And, And,” collection of vignettes that I warn against in my Science letter. And yet, the fact is, if your raw material is just incredibly engrossing and dramatic and watchable by itself, there is the rare instance when that’s all you need. 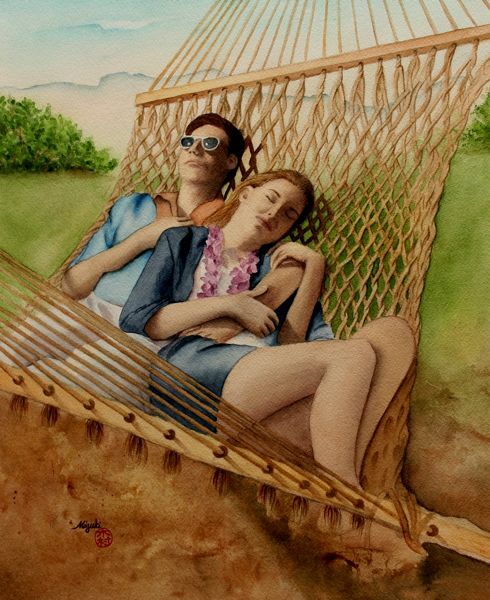 And this movie is it. In fact, it’s elegant how cleanly and simply the material is presented. Just one tragic tale after another of shoddy practices which have eventually caused the loss of lives while the animals continue to suffer. But this is indeed the rare exception. Just look at the subject matter—whales. You couldn’t have a more immediately compelling topic to begin with. Whales and human death—can’t beat that. So that’s the problem. Whales and death—an easy sell—little need to sweat it on the overall narrative front. Climate change and human discomfort eventually leading to death through chains of events … that’s a much tougher challenge. All of which sets the stage for the big climate communications extravaganza of 2014 — the upcoming Showtime series, “The Years of Living Dangerously.” In my Der Spiegel interview (picked up last week by ABC News) I had talked about it as a possible source of hope in combatting the bo-ho-horingness of global warming, but that material didn’t make the cut, which is a shame. I know that a lot of good people have worked very hard on the series, and they have the best possible science advisor with my buddy Joe Romm, the longtime climate blogger, so you can be assured the science of the series will be excellent. I’m looking forward to it and hope it becomes a role model for how to “do it right” in the broad communication of a serious environmental issue. Here’s to 2014 being, “The Best Year in Environmental Communication”!